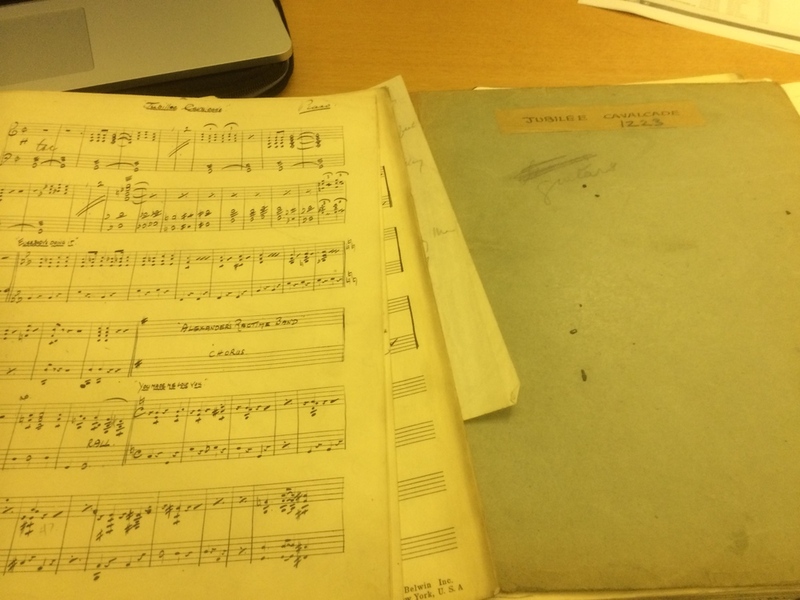 Below is a list of the tunes which I have so far transcribed either from the original scores in the Jack Hylton Archive, or simply using my ears, from the original recordings. The idea is that these arrangements are freely available in PDF form for download and for use by you. All I ask is that you don't distribute them any further, rather you point people in the direction of this website. I think it would also be nice that I got a mention if you performed any of these, and perhaps a push for the audience to also visit the site. I think they're good, but I won't accept any responsibility for wrong notes or things which you don't think are interpreted the way you'd like. Sold as seen! Most are available in the original scoring (click on 'SCORE' for the full score or 'PARTS' for the individual instrumental parts) and also with a modern 17 piece big band scoring (click on 'BB SCORE' or 'BB PARTS'). I've also added any appropriate notes I made whilst working on them. If you've any queries or questions, don't hesitate to get in touch, and if you use them, please let me know. If you either can't or don't want to download them, the arrangements are available to buy in the online shop (just click on the link at the top) - printed on high quality paper and professionally taped together. If you'd like to donate some money to me for this project, I'd be very grateful for that too! Simply click on the button below to take you straight to PayPal, where you can donate any amount large or small. Thanks in advance for your generosity! Special thanks to Brett Lowe for transcribing a number of these arrangements. Thanks Brett! Simply click on score or parts to view them in PDF format, or right-click to save them. A Little Rain Must Fall (HMV BD-5571 06/06/40) Male vocal. Ain't Misbehavin' (Concert Arrangement) (HMV C-1779 08/10/29) Longer than recorded version. Male vocal. Alexander's Ragtime Band (HMV BD-5413 10/10/38) Female vocal. All Through A Glass Of Champagne (HMV BD-5548 02/12/39) Female vocal. Amy Different to the recorded version. Male/band vocal. Transcription by Brett Lowe. Amy (HMV B-5836 02/06/30) Male/band vocal. Transcription by Brett Lowe. Anything Goes (HMV BD-172 06/06/35) Female vocal. Blue Skies Around The Corner (HMV BD-5446 13/12/38) Male vocal. Breakaway (HMV B-5658) Male vocal. Cheek To Cheek Never recorded - contains seven part a cappella vocal! Choo Choo (HMV B-5973 03/02/31) 4 part male vocal. Transcription by Brett Lowe. Colonel Bogey (Decca F-2785 13/01/32) Slightly different arrangement to the recording. Male/ensemble vocal. Dance Of The Blue Danube (HMV B-5500 22/06/28) Transcription by Brett Lowe. Dancing With Tears In Your Eyes (HMV B-5899 10/09/30) Male vocal. Darktown Strutters Ball (HMV BD-5550 26/05/39) Scored for several soloists, slightly shorter than recorded version. Did You Mean It? (HMV BD-5142 01/12/36) Swingtette vocal, scored for female trio. Ever Since I Kissed Her On The Volga (Decca F-2876 09/02/32) Male vocal. Gentlemen Prefer Blondes (HMV B-5112 17/08/26) Male vocal (not on recorded version). Happy Feet (HMV B-5843 09/05/30) 3 part male vocal. I've Got You Under My Skin Never recorded - length of vocal has been guessed. I Kiss Your Hand, Madame (HMV C-1616 27/11/28) Male vocal. Jeepers Creepers (HMV BD-5465 08/03/39) Female vocal. Let's Do It (Let's Fall In Love) (HMV B-5622 26/03/29) 3 part male vocal. Life Begins At Oxford Circus (HMV BD-14 20/03/35) Band vocal. Mad About The Boy (Decca F-3185 03/10/32) Female vocal. The Man I Love Never recorded - drum part guessed, Cor Anglais solo on alto. Me And Jane In A Plane Very different to the recorded version - no vocal. All rhythm section parts approximated. Music, Maestro Please (HMV BD-5407 20/09/38) Male vocal. Night And Day Different arrangement to recorded version. Male vocal. Oh, Listen To The Band! Never recorded - arrangement as per "The Very Best Of Jack Hylton" CD. On The Sunny Side Of The Street (HMV B-5844 03/06/30) Male vocal. One, Two, Button Your Shoe (HMV BD-5166 10/01/37) Swingtette vocal, scored for female trio. Rhymes (Part 1) (Zonophone 5997 16/10/31) Male vocal. St. Louis Blues (Decca F-3239 05/10/32) Male vocal. Shadow Waltz (Decca F-3672 28/07/33) Male vocal. She Shall Have Music (HMV BD-5017 03/01/36) Male vocal. Shepherd Of The Hills (HMV B-5207 11/02/27) Male vocal. Longer than the recording. South American Joe (HMV BD-203 15/07/35) Male vocal. Stormy Weather (Decca F-3572 11/05/33) Extended outro, vocal section adapted to fit recorded version. The Band That Jack Built From the film "She Shall Have Music" - never released on record. Male/female vocal. They All Do The Rumba (Decca F-3527 06/04/33) Lyrics in v2 are wrong, but no reference recording at time of arranging. Tiger Rag (HMV BD-5128 24/08/36) Not to be confused with HMV B-5789 from 1930. Under The Roof Of Paris (HMV B-5949 21/12/30) Male vocal. Vibes put into piano part. Oboe line on clarinet. Waltzing In A Dream (Decca F-3526 06/04/33) Male vocal. We'll Meet Again (HMV BD-5540 29/11/39) Female vocal. When You're Smiling (HMV B-5852 02/06/30) Male vocal. Oboe line on clarinet. Why Did She Fall For The Leader Of The Band? (HMV BD-5023 19/01/36) Male/female vocal. Ya Got Something There (HMV BD-635 02/12/38) Male vocal. You've Got The Wrong Rumba (HMV BD-5119 07/10/36) Female vocal. Zing! Went The Strings Of My Heart (HMV BD-163 11/05/35) Male vocal trio, though solo on recording.